On August 25, 1919 John and Mary Baranczyk of Hofa Park, WI received a gift from God – a daughter. They named her Anna but little did they know that God would invite this child to choose religious life and take the name of Sister Lenore. “There were 14 children in my family, I was the second youngest, and we lived on a 160 acre farm where work was always plentiful,” Sister Lenore said. She spent a lot of her time working in the garden and fields during the harvesting time and she drove horses and later the tractor, bringing the produce to the barn and silo. To earn money during the winter, she took a job at St. Vincent’s Hospital (Green Bay, WI) when she was 17 years old. At first she worked in the kitchen, as a maid on the surgical floor, and later as an aide helping with patient care. “I was happy to receive $4.25 per week and thrilled when it was increased to $5.50 after six months,” she said with a laugh. It was during this time that she became acquainted with the Hospital Sisters of St. Francis and she also lived among them in the girl’s home at the hospital. Shortly after beginning her job, the Superior made arrangements for a visit the Motherhouse in Springfield, IL. Tony Auskis, a hospital employee, drove Sister Lenore and the other girls to the Motherhouse - a visit that changed Sister Lenore’s life. She felt that God spoke to her through the hospitality of the Sisters, the peace of the grounds, and the beauty of the Adoration Chapel. 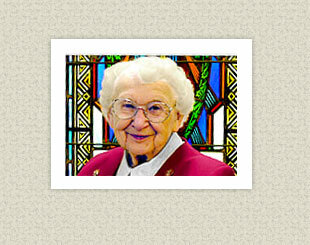 Upon returning to Green Bay, Sister Lenore discerned about what God was asking of her. “I entered the convent on February 2, 1939 and while I felt a calling, I also told myself that if I did not like it I could always go back home,” she said. But she trusted in God and made her Final Profession in 1946. That same year she went to St. John’s Hospital, Springfield, IL for nursing education. After graduation, she remained at St. John’s for a short time and then went to Chicago with two Sisters to start a home nursing program. “Our place was called Alverna Home Nursing Center on 51st and Bishop Street and we did not know our way around Chicago. So we set out to visit our first patient who lived on the east side but somehow the bus took us to the west side. Unfortunately, we never saw the patient that day and just gave up trying to find his house. However, I knew there just had to be another way to get around Chicago and so I got a map and studied the bus route. After that, I did just fine for four years in the city,” she said with a grin. She returned to St. John’s as the head nurse on the medical floor and served for one year. In 1956, she was asked to go to St. Francis Hospital, Washington, MO as the Superior of 25 Sisters and as the administrator of the hospital. (Hospital Sisters sponsored this hospital from 1926-69.) “I was shocked when Mother Canisa told me this news. I had no experience but God inspired me to say the right thing to the physicians, patients, and everyone I worked with,” she said. While she was there, she started the first Advisory Board among the Sisters’ hospitals. She also enrolled in a three-week course for new administrators at St. Louis University. The assignment of Superior and Administrator was not a nine to five job. Whether it was official functions of running the hospital or the work in the kitchen, caring for patients or moping floors, Sister Lenore worked everywhere she was needed. “One night a patient even escaped from the hospital and we began a city-wide search. I asked Henry, an employee, to help me find this patient who we found sitting on a bar stool in a nearby tavern having a drink,” she laughed. She was at St. Francis Hospital for five years and was then asked to enroll at St. Louis University for a course in hospital administration. The course also required an internship of nine months and Sister Lenore went to St. Mary’s Hospital, Madison, WI. Her assignment then took her to St. Nicholas Hospital and Anna Reiss Home for the Aged, Sheboygan, WI as Superior and Administrator for six years. Next she served in Page, Arizona as Administrator of the Government Hospital followed by a return to Green Bay where she ministered at St. Vincent Hospital and Americana West Nursing Home. In 1986 she accepted a position as a Discharge Planning at St. Mary’s Hospital Medical Center, Green Bay. Sister Lenore currently resides at the Motherhouse and is very active in her prayer life, serving at the Convent Entrance, walking each day, and making greeting cards. For many of us, we tend to forget how God journeys with us and how He listens to our prayers. Sister Lenore’s story is a reminder that what we need to do is close our eyes, say a prayer, have faith, and know that God is near.